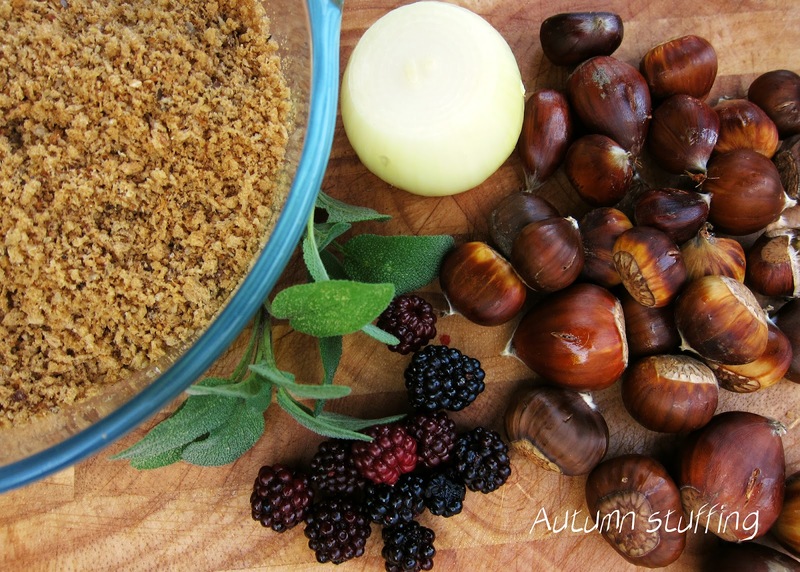 I know chestnut stuffing is pretty common in supermarkets especially at Christmas but I've never actually tried to make it myself. Call it an Autumn stuffing mix, I combined wild chestnuts with some blackberries that I collected from our local woods.Mix enough dried seasoned bread crumbs with an equal amount of ground roasted chestnuts. Add some fresh sage, a finely chopped onion and a handful of blackberries to the mix. Bind with some warm water and olive oil. Stuff inside your chicken or role up into small balls and roast for 20 minutes at 200C. I think I've seen recipes for chestnut stuffing, but I've never seen it for sale on this side of the pond. I'm not generally a great fan of stuffing, but yours sounds interesting. Thanks Gorges, came out tasting pretty good for an experiment. Would definitely make it again.